When economists talk about the national debt of a country, they really mean the government debt. The debts of individuals and companies are not counted in the calculation of national debt. There are a number of different standards that dictate what figures to include and which items to exclude when calculating the national debt. The Czech Republic is a member of the EU and so it has to follow the standards specified in the Maastricht Treaty when calculating its national debt even though it is not a member of the Eurozone. EU membership also means that Czech economic statistics are tracked by Eurostat. When economists consider the national debt of a country, they are more interested in the debt in relation to the country’s national income, which is called Gross Domestic Product (GDP), rather than the absolute amount. This metric is called the debt to GDP ratio and it is expressed as a percentage. When looking at the debt to GDP ratio of the Czech Republic for a particular year, you may well encounter several different figures. This is because the international bodies that report on national debt all follow different rules. Eurostat includes the obligations of the Czech Republic to EU institutions, such as the country’s guarantees to the European Financial Stability Fund. The IMF doesn’t include these obligations. The OECD does include obligations to EU institutions and also all other loan guarantees given by the government of the Czech Republic to other institutions within the country. There are other factors apart from debt category inclusion that create the differences between these evaluations. In the case of fixed-value bonds, the face value and the nominal value are the same. However, index-linked securities increase in value over time and so their redemption cost is higher than the face value. This makes the nominal value higher than the face value. Market values are usually higher than nominal values. Eurostat and the government of the Czech Republic use nominal values when counting the bonds issued by the country for the purpose of calculating national debt. The IMF and the OECD use market values of bonds in their national debt calculations. The general government debt that is reported as the national debt counts up the values of all the loans and outstanding debt instruments issued by all levels of government in the Czech Republic. This is also known as “gross debt.” The IMF also publishes “net debt” figures for each of the countries that it monitors. To calculate net debt, the IMF adds up the value of all of the financial assets that the Czech government holds and deducts that figure from the gross debt of the country. The assets included in this calculations are only shareholdings, currency holdings, and other liquid assets. Physical assets, such a government buildings, art collections, and military equipment are not included. In the case of the Czech Republic, the IMF calculated a gross debt to GDP ratio of 34.7% and a net debt to GDP ratio of 22.9%. That means that the IMF judged the financial assets of the Czech government to be worth the equivalent of 11.8% of the country’s GDP. That means that the Czech government could pay off about a third of the country’s national debt if it sold off all of its financial assets. Is the Czech Republic’s national debt growing? The Czech Republic joined the EU in 2004. Maastricht Treaty stipulations require that all EU members get their national debts down below 60% of GDP. The governments of EU nations are also required to keep their annual budget deficits at no more than 3% of GDP. The government of the Czech Republic had no need to alter its working practices in order to comply with the EU’s debt rules. The Czech debt to GDP ratio hit its lowest point of 11.6% in 1996. The national debt had risen steadily since that date, but by the end of 2003, it was still only 28.3%, which is well below the EU membership national debt limit. The country managed to keep its debt to GDP ratio between 27 and 29%. The global financial crisis of 2008 didn’t have as extreme an effect on the economy of the Czech Republic as it did on many other EU members. Nevertheless, the government still needed to provide liquidity to the economy and it ran a high budget deficit for 2009, breaking the Maastricht requirements. 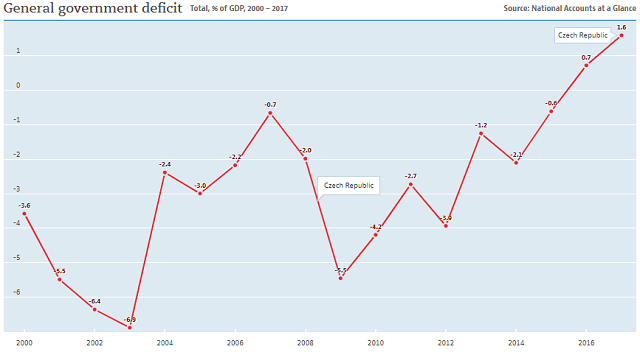 The Czech Republic’s debt to GDP ratio continued to grow until 2013, when it peaked at 44.9%. 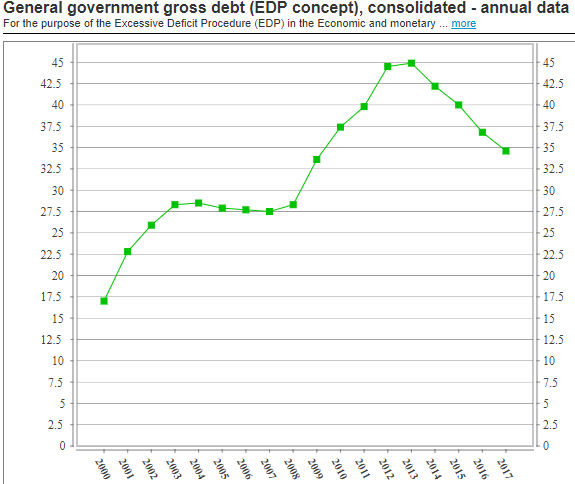 Since that date, the national debt has declined down to 34.6% by Eurostat measurements. The government managed to bring its budget deficit above 3% of GDP in 2013 and continued to improve its saving. The Czech government posted budget surpluses for 2016 and 2017. What is the Czech Republic’s credit rating? The government of the Czech Republic’s debt management skills has earned it a good credit rating. All of the major credit rating agencies give the country A-grade ratings both for foreign and domestic currency securities. The country doesn’t have the very best credit rating, however, it is in the top division. France and the United Kingdom are only one rung higher than the Czech Republic in the Standard & Poor’s league table. Who manages the Czech Republic’s national debt? The Czech government’s Ministry of Finance is responsible for setting the national budget every year, which is where the national budget originates. The government needs to get approval from the national parliament for its budget every year, because the representatives of the people have the ultimate responsibility for the debts accumulated by the government. A department of the Ministry of Finance, called the Debt and Financial Management Section (Department 20) is specifically tasked with managing the national debt. Department 20 doesn’t implement debt raising itself. That job is contracted out to the Czech National Bank. How does the Czech National Bank raise loans? The Czech National Bank runs the primary market for Czech government securities and it also oversees the secondary market for those instruments, which is called MTS Czech Republic. Government securities are sold only to primary dealers by auction. The primary dealers are pre-approved agencies that are expected to sell on their allocations by placing them on the secondary market. What securities does the Czech government sell? The Ministry of Finance, through the Czech National Bank sells Treasury bills to feed short-term financing needs and bonds to cover long-term finance. The Treasury bills do not pay interest, but are sold at a discount and redeemed at face value. The government issues bills in maturities of 3, 6, 9, and 12 months. The Czech government doesn’t issue index-linked bonds, which makes accounting a lot simpler because that makes the nominal and face values the same. All bonds have either a fixed-rate of interest or a floating rate. Floating-rate bonds represent 12% of all outstanding debt stock. What facts should you know about Czech Republic's national debt? You could wrap $1 bills around the Earth 345 times with the debt amount. If you lay $1 bills on top of each other they would make a pile 9,681 km, or 6,016 miles high.